Drivers glove, Unlined Select Grain Cow Leather, Keystone Thumb, cut/puncture protection. Alycore™ is one of the most cut and puncture resistant materials available. Our Alycore™ gloves offer maximum dexterity and sense of touch due to the high degree of flexibility and patent pending construction. All Alycore™ styles provide cut performance levels, which exceed ANSI and CE cut level 5 ratings. From wranglin' to buildin', these gloves are tough for the job! Cowhide is the most commonly used leather due to availability. Characteristics include a good balance between abrasion resistance, dexterity, durability and comfort. 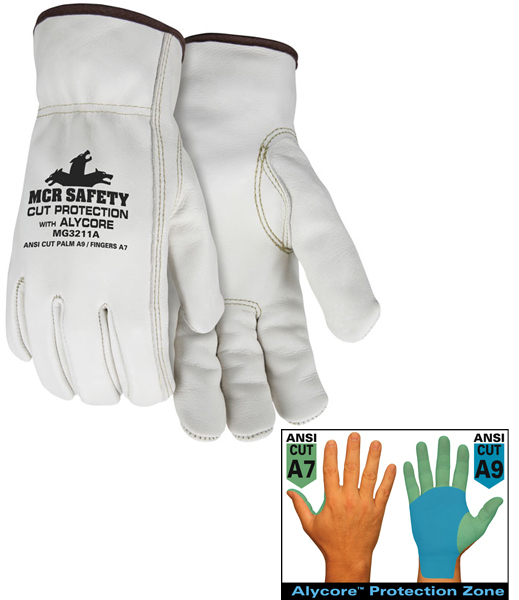 The MG3211A drivers gloves feature; unlined select cow grain leather, shirred elastic back, cotton hemmed, a keystone thumb pattern, and Alycore™ in the palm and fingers (see protection zones).